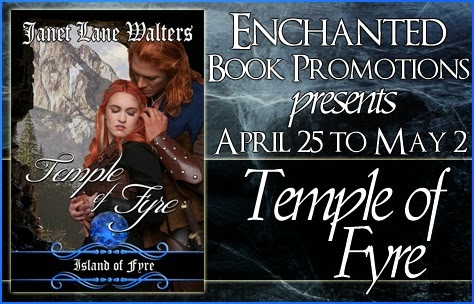 I'm proud to interview Jane Lane Walters, author of the fantasy romance novel Temple of Fyre, as part of the Enchanted Book Promotions blog tour. I’ve been a published author for 46 years but not consistently. I took time out to return to nursing to help put four children through college. I’ve written about everything except horror and fiction that tends toward the scientific. As to calling myself as the eclectic writer that came about because I just can’t stick to one genre though most of my stories have a romantic element present. I’ve been married to the same man for fifty plus years. He’s a psychiatrist who refuses to cure my obsession with the written word. There are four children, one an adopted biracial girl. I’ve seven grandchildren. Four are biracial and three are Chinese. Besides writing and reading I’ve an interest in Astrology and delved into a number of handicrafts like needlepoint and knitting. I have also composed music and have heard my compositions performed a time or two. Describe the plot of Temple of Fyre in a few sentences. A rebelling priestess who can use the fyrestones with ease meets a stone finder. 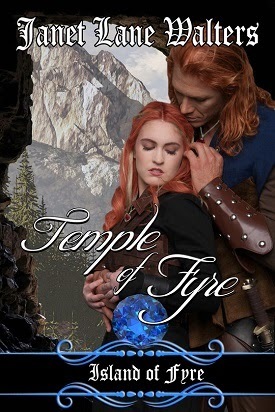 As they unite to defeat the evil priestess of the Temple of Fyre attraction becomes a love that unites them completely. Lovers of fantasy. People who like strong heroines. Those who enjoy handsome and resourceful men. Lovers of romance. Fyrestones are a prominent part of your story. Can you explain what they are and how priestesses can use them? Fyrestones are a total invention of mine. The stones are the colors of the flames. White, yellow, orange, red and the rare blue ones. The priestesses attune themselves to the gem and thus can cause havoc or healing in other parts of their section of the Island of Fyre. Tell us a bit about the two main characters, Ari and Ria. Ari is the hero and a stone seeker. He was abandoned as a child and wishes to know who left him and why. He is tall and his hair has streaks of the colors of the flames. He has a red fyrestone though according to the chief priestess of the Temple of Fyre a man cannot have one and cannot use it. Ria was sold by her desert clan after the death of the man she was to wed. The slavers brought her to the temple and Malera the chief priestess bought her and trained her. Even as a child Ria had a streak of rebellion and her searches of the archives of the temple lead her to doubt some of the things she has been taught, Her doubt leads her to rebel against the chief priestess during her testing causing many of the fyrestones of the lesser priestesses to burn out. She is beaten and stoned. Left to die outside the temple she fights for life and is discovered by Ari. The chief priestess, Melera, has insidious intentions, and seems to have little regard for the lives of others. What drives her? Malera is driven by power. Believing there is no priestess stronger than she is she seeks to destroy anyone who rebels against her. No one will take her power from her and she has used her ability with the red firestone to gain her position and to destroy others and even towns. I really don’t have any favorites among the three characters. When I’m writing them I become them. Can you tell us a bit about the creative process of writing this book, from the initial idea to the finished manuscript? I have a fascination for gems and spend time studying them. For some reason the word fyrestones came into my head. Now the way I usuallly begin a book is to start telling myself a story as I’m falling asleep. This gave me the plot. I’m very plot oriented. I sat with my note book and began to develop the main characters and slowly I began the rough draft of the story. This was rather short. All the chapters in about 20,000 words. Then I scribble over the typed pages adding details or notes about what I’ve written. Then I write the story again, making notes on characters, plot, setting, dialogue, emotions. Then I rewrite and go through the story for word choice and other things. At my age, I really can’t look at ten years. I really only decide what I’m going to write in the next year. At present this includes a complete revision of a right’s back book, finishing the fourth in the dreams series and starting and maybe finishing the third Islands of Fyre – Mages of Fyre. When each book is finished I add a new one to the list. Some are for existing series and some are new. Never had writer’s block but I did have a time and exhaustion block. During the time I worked as a nurse on thirteen hour shifts and going to college to finish my BA in English and BS in nursing I made notes and jotted ideas. Perhaps the reason I haven’t had writer’s block is that I look at each project as fun and I do vary what I write. I write with a pen and paper, then type and often do the next draft on paper and type. Then it’s going over the typed ms as many times as it takes until I decide I’m sick of this project and am ready to do something new. My next project has already begun. That’s called Divided Dreams and involves a doctor who gives up being a doctor to write and a nurse practitioner who he hurt 12 years before and a baby who is niece to both of them. There’s also the Taurus Scorpio romance I’m re-writing to bring up to modern times. Very nice interview, Janet--and the cover on this one is great too.